The latest band to make the transition from the rich catalogue of Sublime Frequencies recordings to the live stages of Europe is perhaps the most anticipated of them all, the one we have been waiting for since Guitars From Agadez Vol. 1 first stormed from the speakers and sold out in record time four years ago: Group Inerane. 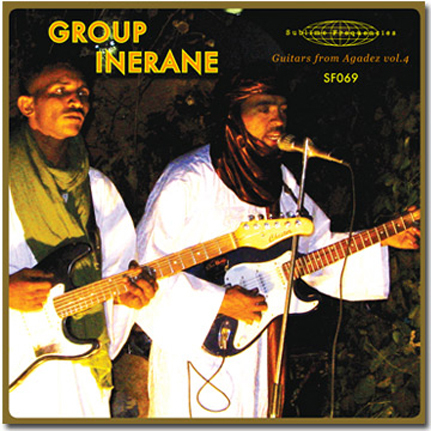 Simmering up from the rebel heart of the Tuareg guitar scene, Group Inerane are a rough-hewn, tranced-out psychedelic juggernaut careering off the path beaten to the West by their peers Tinariwen and Group Bombino, coursing instead along a thrillingly scuzzed-up parallel lineage to Link Wray, The Velvet Underground and even Creedence Clearwater Revival. Centred around band leader and six-string gods Bibi Ahmed and Koudede, Inerane hail from Agadez, Niger, one of the most volatile zones in West Africa. Out of this vast, arid land long beset by political unrest comes the Inerane sound, fit to bring tumultuous joy to any party on the globe: ecstatic and electrified Saharan guitar modes entangle/disentangle themselves around mantric vocals and propulsive trap kit drum attack. Genuinely rocking and raw as hell, at points the fuzz descends and Inerane seem to bore their way to the mainline of rock and roll itself. This is Sublime Frequencies first ever 7" release to coincide with Group Inerane's first ever European tour. Three blazing and incendiary tracks recorded in Niger by Hisham Mayet. 7 inch. Extremely limited tour-only edition available for a short time for the discerning public.